It can be extremely difficult to keep birds from eating grass seed on your front lawn or backyard. There are a number of different steps that you can take to try and prevent them from ruining your grass on your property. This article is going to provide insight into how you can take actions to prevent this from happening. One of the most effective ways to prevent birds from ruining your grass is to defend them with visual aspects that will scare them away when they begin to get too close to your lawn. Scarecrows and other visual deterrents are great ways to prevent them from ruining your high-quality grass in your yard. There are different types of scarecrows that you should consider based on the type of birds that you are trying to keep away, but most cases a standard scarecrow will get the job done. There are also some other scare tactics that homeowners can take to scare birds away from their grass. One of those actions can read a place a noisy object in the backyard near the lawn so that birds will periodically be scared away from the grass field when the noise goes off. Feeding the birds elsewhere on your property is a great way to prevent them from actually going to your grass. You could potentially detour the birds from the lawn towards a select number of bird feeders on the property that are generously placed so that the birds can access seeds from there instead. The downside to this is that there is a slight set up cost for the bird feeders and that you’d have to constantly continue buying bird food, but some people will say that this is worth the price in order to defend the lawns themselves. It would be smart to place bird feeders in locations that are significantly further away from the lawn so that other birds do not elect to detour towards the lawns rather than the bird feeders. There’s a good chance that if you place your bird feeders strategically that all of your grass will remain intact and not succumb to the effects of the birds. Some people believe that the best way to take care of seeded grass is to place a physical barrier between the grass and the birds. This may seem a little bit too difficult, but in a lot of cases, it is actually proven to be very successful if established correctly. Cages, fences, and other types of physical walls or barriers can often be used to prevent birds from accessing the seeded grass. In many cases, wire fences and net traps have consistently proven to be an effective way of defending grass from birds. 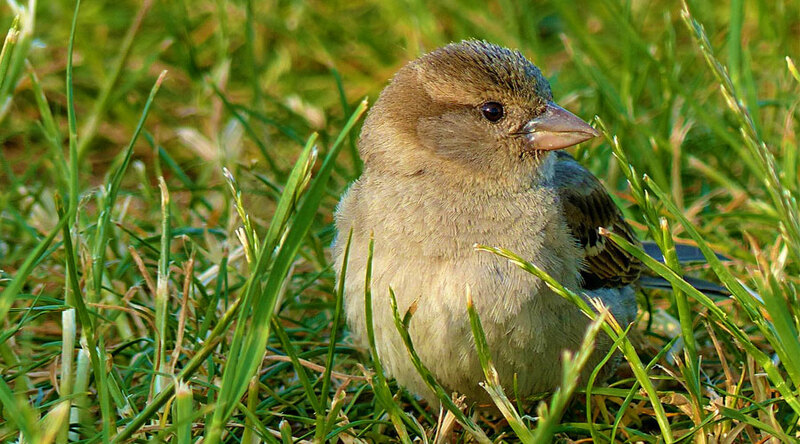 Dogs and cats can actually play a huge role in defending birds from grassy areas in your yard. If you have an outside dog or cat, odds are is that they will naturally deter the birds from entering the premises and that all remaining birds will be scared away when the dog or cat is present. While this may seem like an extreme measure, chances are that it will prove to be an effective way to defend your grass. What may seem like just a game to your dog or cat is actually going to prove to be an extremely effective defensive technique to protect seeded grassy areas from hungry birds. There’s always a chance that just one of these measures will not be effective enough in order to defend your grass and that they’re too may be continuous issues even after taking some action. You may want to try just about any combination of the items listed above in order to protect your yard from birds. Depending on your circumstances, some of these recommendations may not work immediately or at all. In most cases, at least one of these measures will defend your yard from birds. Visual scare tactics and alternate bird feeders are a great place to start in order to begin defending your yard against birds. If the first two defensive measures don’t work, then it may be time to begin establishing a physical barrier like a cage or net prevent birds from entering the grassy area. Alternatively, owning a family pets and placing them outside in the yard during the day can be a great way in deterring birds from landing on the grass. If any combination of these recommendations does not work, why not try all of the above? There is no harm in trying a combination of these measures in order to prevent birds from accessing the seeded grass. It can be extremely difficult to figure out how to prevent your grass from being ruined by hungry birds that are looking for seeds. By using your imagination, you may be able to come up with your own creative ways to defend your grass from birds. You may be interested in trying any combination or variance of these methods and recommendations that are mentioned here. Alternatively, you can come up with your own ideas in order to prevent birds from invading your property. It is important to remember that it is worth spending a little extra money on some of these bird deterrents before your grasses ruined rather than having to spend money on repairing the grass and on bird deterrents after the fact. By paying a visit to your local hardware store, you could potentially find some tools that can spark some ideas so that you can prevent birds from accessing your yard. If you take action ahead of time, you’ll be well on the path that leads you to defend your yard for many years to come. Where to Find Amazing Bird Feeder Plans! Best Bird Names: Popular, Male, Female, Cute, and Unisex!